PHM-Canada and PHM-USA work closely together on a number of issues which have a cross-border impact. The People’s Health Movement Reproductive Justice Working Group stands by grassroots organizations and movements struggling for access to safe abortion as a universal human right and a matter of social and economic justice. You can contact the working group through Martha in Canada, and Meike in the US. Read more. The working group on extractive industries launched in 2012 our working group with a statement to the third People’s Heath Assembly. A network of health justice activists across the world, the group seeks to support members in struggles against extractivist industries. 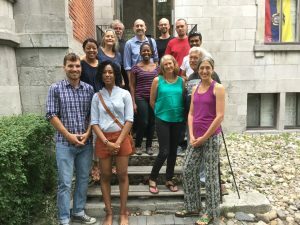 “We are united by our common desire to protect our communities in the face of the onslaught of natural resource exploitation.” Join us! Contact Baj (Canada) or Sarah (USA). The trade and health group works to raise awareness and resist international trade agreements and practices that threaten the right to health. We resist free trade agreements that negatively impact social determinants of health. And we also struggle against practices such as privatization of health services. We advocate for transparency, people-centered trade agreements, and respect for our right to health. Contact Baj (Canada) or Leigh (USA) to connect with our work.